These are the good times and I have been waiting for the good times to end for years. These magicians or the master gamblers, whatever you call them, are very talented. They add up more debt by the trillions, and still able to keep this casino going. There is no end in sight. I am starting to develop respect for them, you know. Don’t worry, the current ‘official’ rate of inflation is well above 2% closing in on 3%. Good luck lowering interest rates. Interest rates are set by fiat by central planners – interest rates will be lowered and soon. The Fed is a (not so) independent corporation but they serve at the behest of the government and the powerful banking cartel, both of these entities will demand lower interest rates to stay afloat and the Fed will give them what they demand. Our craft has passed the black hole event horizon, of structural deficits growing out of control, faster then GDP, and no currency can survive after this point has been passed, we are being sucked into the black hole of ever growing piles of fiat currency – it’s too late to escape the gravitational pull. Not sure exactly when, but likely within 5 years, there will be a panic to get out of the dollar. When that happens the dollar will hyper inflate and those left holding electronic currency units in various accounts will be holding a bag of poop. The game is over except for the yelling. The U.S. government is left with one last piece on the chess board yet they refuse to concede they have lost – childish. How will Americans, so accustomed to a something for nothing lifestyle, react to not being able to purchase consumer products and endless military hardware with freely created money? No doubt many will not survive – that’s on Bernanke. These magicians or the master gamblers, whatever you call them, are very talented. They add up more debt by the trillions, and still able to keep this casino going. These gold collar criminals have used their control of the Fed and central banks to create the biggest asset bubbles and debt pyramids in human history. This “boom” is fake wealth created by fake money, using tricks like stock buybacks with borrowed money that used to be illegal, while captured and complicit regulators, enforcers, and policymakers have set the stage for a financial collapse that is going to dwarf every other financial crisis this planet has ever seen. Let’s see….that’s about 65K in national debt for every man, woman, and child residing in the United States. Not sure I got my money’s worth there. Heck, for another 10K, I could have bought a Tesla model S.
It won’t be paid. Soft or hard tacos. Choose your default. Of course it won’t be paid off. Why would it? No one in the US expects to pay off debt. It is paying the interest on the debt that causes the problems: for companies, for individuals, and for countries. And that will set the limit on how high the FED allows interest rates to go. And the higher the debt, the lower that number will be. In fact as debt continues to rise either govt revenues will have to rise (haha) or interest rates will have to come down. There is no absolute need for the Federal government to issue debt to spend money. JFK ordered some money to be spent without associated debt, but not sure if it ever got done or not. Thus, the federal debt is a different issue than the rest. Print 10X money and raise price 10X, GDP goes up 10X, debt/gdp drop by factor of 10X. Old debt is paid, integrate rate 1000% for new debt. Here is the thing, the 1000% in new debt is the rate for the coming 1 year or two but you can destroy the debt accumulated for the past 30 to 40years. Debt paid. I am NOT suggesting this is practical, but this is a thought response to your “debt will NOT be paid and rate can NOT rise” conclusion. Germany tried deficit spending instead of raising taxes after WWI to pay off its war related debt and reparations. By 1923, German paper money had become virtually worthless. It created a few winners but many losers. Under the old Gold Standard, 1 German mark was worth about $0.25 US. At the time of the final currency collapse in late 1923, it took 4 trillion marks to buy $1 US. When the German unemployment started to increase significantly after the (US) Smoot-Hawley tariff was passed in 1930, many Germans became disillusioned with the old line political parties. In 1932, the Nazi party was able to tap into this dissatisfaction and gained the largest number of votes in two sets of national elections. I guess our politicians in DC think nothing really bad will happen on their watch. I hope the future generations that are being shafted by all this debt are absolutely remorseless when it comes to settling accounts with the Boomers and policymakers who bequeathed them this sorry state of affairs. These last few years have been a marvellous adventure, where one challenge after another has been overcome. We thank you for the expediency of your payment. If for any reason you think you have been overcharged and that part of the amount withdrawn should be returned to your account, please think again. Brilliant, Crysangle! You should write a book! Thanks. I was told once , but for now, and apart from some usually unfinished private essays, I like comments because it is much more interactive :-) + there is the question of time. Until I actually find the theme of the story to express what I have to say, which itself is still evasive and probably why it needs a book to give it definition, well I guess the rest is a form of practice and learning…a bit like running the gauntlet sometimes but it sure gets you into shape. That letter should include a coupon for a discount on K-Y Jelly. My bank account was hacked. It wasn’t me that spent that money. It was those “no-accounts” across the railroad tracks. So lower margins, increasing wages and the backdrop of ever higher rates? I would have thought the US Gov would have made plenty of revenue from property prices. You are correct, the government rakes in capital gains taxes during asset bubbles. However, only about 50% of households pay any net income tax (inclusive of the EIC welfare payment). Imagine how much better governance we’d have if the only people who got to vote are those who paid more into the system in taxes than they take out in benefits. The U.S. federal government collects very little in property taxes. Property is taxed at the local government level. And those who claim half the people in the country pay no income tax are ignoring the fact that taxes on income are much less than half the funding going into the federal, state, and local governments. When you include payroll taxes, sales taxes, property taxes, and excise taxes, the tax burden in the U.S. is very proportional. A recipe for chaos. QT is well under way, so it’s no wonder that some auctions go awry, as in last week’s 5Y issuance. Effective demand evaporated. Non-comp allocation was only $38m of $38b, btc and trailing yield were awful. Some commentary suggests PDs were waiting for the FOMC statement. This sounds like an expedient explanation. By the way, the Fed has no idea of the quantum of currency in circulation. How that plays in to M2 stock and velocity is quite a perturbing matter. It just looks, to the simple-minded like me, that the entire data edifice is built on serial correlation and error. Nice way to manage a global reserve currency. Not to worry, the Republicans will eliminate Social Security, Medicare, and all the rest of the social safety net – and blame Democrats. When it all comes crashing down, it’ll be grim times. When America defaults – those programs will default by definition. Not as long as we use a fiat currency that can be created effortlessly and in infinite amounts out of nothing. There you go! The charade will continue until confidence is trashed. “Perception is 99% of reality”. The financial world today is a mirage built on smoldering paper. The government does not have to eliminate the programs to cause a lot of damage. Merely by not adjusting the levels at which Medicare premium surcharges kick in will cause a growing number of seniors a lot of financial hardship. Allowing Social Security benefit increases to seriously lag the inflation experienced by many seniors will also cause pain. Everyone will get their check with the expected numbers on it. It just won’t buy what they thought it would. It such an easy path, how can the government not take it? Agreed, that is precisely what will happen. Rates will spike leading to a crash/recession forcing the Fed into another round of QE to buy the debt from the UST.. If there’s one ledger you don’t want to be stuck on it’s the USD.. own anything but USD… anything! you suggest that there is another currency that is stable or solid? All asset classes have issues. Some have storage and or security costs. Others have holding costs like property taxes and maintenance. Many are just outright gambling with no real underlying value. Just where/what is it you think is a safe asset to hold? The Rupie, the Ruple, the yuan, the yen, the euro? The Frank? PM’s, king copper or is is real estate? From what I see and read, this is global and all assets are correlated. Maybe farmland on Mars is the best bet. Well, see Wolf’s recent piece on gold / diversification. Agreed, everything is correlated in the everything bubble. Except gold. Thus,when confidence in the dollar plummets, gold will rocket. Until then, it will remain uncorrelated / unprofitable. I think gold is also correlated in that 1/ there is a gold ETF that has puts and calls and shorts and longs. 2/ The big financier have been shown to manipulate its price along with silver. 3/ it is a commodity and many of the miners are heavily indebted.. 4/ and the biggest one, when the market sells off hard, people will be selling any asset that has value to keep from going under and gold will be sold hard. How does manipulation by JPM = correlation. And the ETF with put /calls, etc, how does that = correlation? And indeed, if people choose to sell gold during the next crisis, then it will correlate in a down move. But so would anything that was sold at the time. The question is, for how long will people be sellers and will it be a wise thing to do at the dawn of a global sovereign debt crisis? I’m guessing not. And actually, isnt’ the argument that it is not a commodity? They stock (amount of gold in storage) to flow ratio is unlike any commodity. If it doesn’t walk / look like a duck, it’s not a duck, no? It’s the only way out. Something like the 1970s. 10% a year will solve this in no time. Inflation of that nature will be a last resort. Those with the most money do not want to deflate its value out of existence. Japan’s government debt is well over 200% of GDP and they have had persistently “worrisomely low” inflation for years and years. Can THE MAN explain that? Also, if one totals up all the official and unofficial war spending (DoD, all the spy agencies including estimated black budgets, all the “overseas contingency operations” slush-money spending) it comes to around $1 trillion per year, so Trump’s inane tax cuts aside, if you want the answer to “where is the money going” for those $trillion-a-year deficits over the past decade, you can just say “all the best warmongering and defense-contractor-enriching fiat money can buy.” Hey, all that “shock and awe”-p0rn that gets celebrated by the MSM, complete with special martial musical themes the various news outlets have paid to have composed for their “we are bombing the hell out of some poor bastards somewhere” special-alerts … all that “we are the exceptional empire”-ing, that costs money, OK? Google ‘population of japan’ and you will have your answer. You do like your “one word” non-answers, don’t you? So how does stable population prevent money-printing inflation? If anything it should be the opposite – stable population means low-to-zero GDP growth, thus govt money-printing doesn’t automatically get wholly-or-partially canceled by a growing denominator, thus debt/GDP ratio rises even faster, so the resulting inflation should be even worse than in a country with a growing population like the US, right? We mere mortals await your next oracular “ONE WORD” answer, o wise one! C’mon Wolf, help out THE MAN! 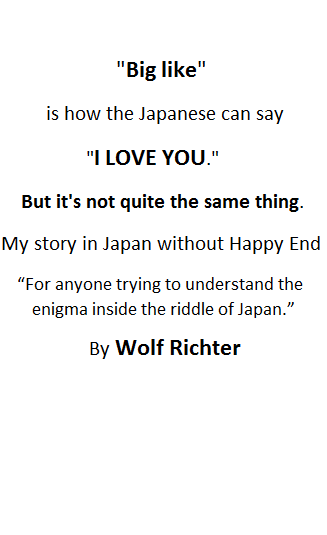 You have to have a single Japanese word that explains why their economy hasn’t yet imploded. I mean, You took a course in Japanese for a few months, 20 years ago, right? I see no reason why we can’t continue to kick the can for at least the next 10 years. There are only three ways to lower debt. If you are a career politician, and want to get re-elected, which one do you choose? Hmmmmmmmm, let me think about that. Need to get re-elected, let’s see……..
With rates rising, however, the plot may thicken well before the next decade is out. What will be the reaction when we’re squandering a trillion dollars per year in interest? That may be be too large of chunk of our budget to ignore. Interest “earned” by the central bank goes to the treasury (this is true in all the central banks I can think of, even in Europe). In effect, any debt held by the central bank is monetized. Japan has shown that this monetization of debt can kick the can down the road for a long time. There are several more options. The government does have assets is could sell. It could spin off the Post Office, for example, or privatize federally held land. It could also selectively default, for example on the I.O.U.s the Social Security Administration is holding for the money used to fight the Vietnam War and for the Great Society. Privitazation of public assets (asset stripping) has been part of the game plan all along I figure. Look at it like a hostile corporate takeover by the plutocracy. Like Greece, just figure out a way to sell off Federal gems to rich insiders who already filled their pockets to overflowing for 25 years, then continue to demonize the general population, in particular pensioners. Here’s an idea, pass a law stating that such assets can only be sold to pension plans for benefit stability. The same law could limit the salary levels of pension directors, trustees, and set rates for payouts. The only thing government can sell is deregulation. The Post Office is worth less than Sears at this point. The problem is liabilities, and you can’t sell them. Look at the dollar in your pocket and what it represents. Any rational being would burn the evidence before the debt collector starts checking your pockets. Sears Holdings market cap is around $105M currently. “Even after the Great Recession was declared over and done with, the gross national debt increased on average by $954 billion per fiscal year from 2011 through 2017. This statement leaves out enough pertinent detail to be potentially misleading. It fails to point out, for example, that deficits under the prior administration had been declining since 2011, dropping below $500 billion in 2015 (downright frugal!). Given this blatantly quantitative trend, Trump’s latest $1.27 budget shortfall is extra staggering, especially for an allegedly conservative president! Where are all the GOP budget hawks now? Their grotesque hypocrisy is enough to boil the blood! You’re talking about “deficits.” But in the sentence you cited, as in most of the article, I was talking about “increases in debt.” Apples and oranges, as I explained at the bottom of the article. I didn’t talk about the “deficit” until I got to the part that begins with, “For the first 11 months of fiscal 2018, …” toward the lower third. As I explained, the “deficit” is essentially a bogus number due to the way government accounting works (fails to work). The distinction between “deficit” and “debt” and “increases in debt” is really key: the CBO’s estimate for the “deficit” in fiscal 2018 is $895 billion. 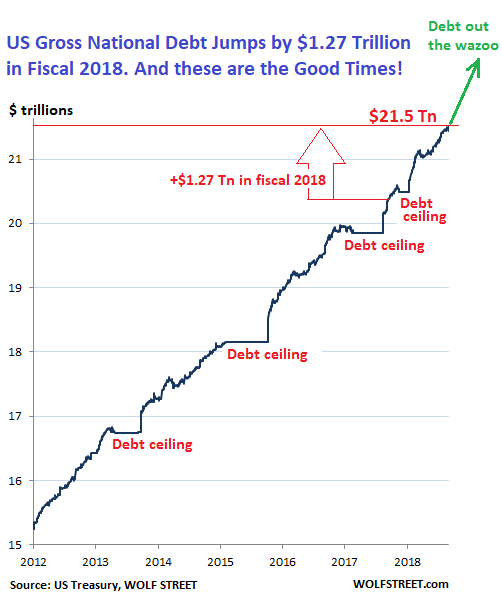 The actual “increase in debt” in fiscal 2018 is $1.27 trillion. Here are the historical numbers for total debt outstanding (i.e. without the public-versus-intragovernmental-holdings BS used for the headline numbers) from the UST website – I’ve started with 2007, i.e. the onset of the “new normal” $trillion-a-year deficits, and supplemented with the 9/28/2018 numbers (which should end up being listed as the 9/30 ones in the historical data, as 9/30 was a Sunday) for the end of the last FY. I’ve rounded the annual-deifcit numbers to the nearest billion. (Sorry, don’t know how to format a table like this to get cols to line up properly using the comments-system here). But yes, the “GOP budget hawks” are well known to be chickenhawks when it comes to $ for their pet stuff, and both parties trip all over themselves when it comes to funding moar war and giving the Pentagon spendthrifts even more than they ask for every year. Spirit-of-bipartisanship budgetary hypocrisy, dontchaknow! The problem is that 40% of GDP is directly related to government spending. From that 40% there is a trickle down effect into other supporting businesses and their economic contributions to the economy. Cut government spending and you get a corresponding cut in GDP, employment, and tax revenues. Cutting government spending creates a greater need for social services and cuts tax revenue. As we’ve seen in other financially distressed economies cutting government largess creates great pain and dislocation that reverberates throughout the nation. So you are saying spending increases pay for themselves? It sounds familiar to the argument that tax cuts pay for themselves. Both seem like fantasies. In reality, there is a balance or relationship that must be maintained. Tax revenues must be enough to pay for the spending. You can’t look at just the revenue or spending side. Gross domestic PRODUCT. What a misnomer that is, if 40% of it is govt spending! Somehow you must have missed the memo, these days we are all about Congressional hearings and soap opera on Capitol Hill, where old white guys scream they will not shut up and the progressives want to be like White guys and have their Spartacus moment. Literally if they had an earthquake that leveled DC, within a week, our representatives will be back strutting their stuff in front of the camera. It’s just so sad how low we’ve gone. But how does it matter? Just keep issuing treasury bills with some far away maturity date. Someone will keep buying them. The current growth is just financed with the funny money from debt. People are enamored with the great economy when it is just being pumped up by all the debt. Yeah, it’s all pretty silly, really. In our desperation to maintain an unsustainable momentum and avoid making painful adjustments in the present we’ve been piling on the debt in ever greater amounts in order to drive our pace of consumption and destruction at ever higher rates, and thereby ensure even more painful adjustments in the future. My personal spending (my personal gdp) would go up dramatically if I borrowed like the government and our corporate *leaders* do! As the GDP really only represents how much we spend, it is a completely flawed representation of how much actual productive income we make. The magic of compounding interest should do the trick. Debt will only be a problem, when America cannot issue it in its own currency, and when oil is not priced in dollars. Right! How about a “Net GDP” number? What a joke worrying about correcting for inflation (real gdp) when you’re ignoring the $1T of debt you just piled on. America will always be able to print USD and oil will always be priced in USD. You can also price it right now!! in VZ bolivars. What matters is if people, including Americans, keep accepting USD as payment for goods. What super power do you think America has to make that go on for the next 5, 10, 20, 30 years? Suicide rate up and birth rate down. 21% unemployment according to Shadow Stats. Most Americans can’t afford a $1,000 emergency. A lot of low paying and part time jobs. Good times baby. Wealthy people think it’s good times, while every person in the middle class that I know disagrees. It may sound trite, but the only solution is more globalization. Should have started high tariffs about 1960, and increased them as high as needed on everything other than raw materials and energy to keep Americans buying stuff made by other Americans. The people voted for a Republican president and Congress. This is the will of the people. @Kent the run rate is +33%, but look again at the years on the chart above and consider your comment. Basically $1T a year, year after year. At least we have employed taxpayers (unemployment 4%) …both deemed impossible very recently. ->At least we have employed taxpayers (unemployment 4%) …both deemed impossible very recently. And if you look through the fog you can see it’s still impossible. Hence the need for more fog. The hard and bitter truth is that many people prefer warm soft lies. A few years ago I asked a well known economist what would it take tomget GDP back to 3%. He laughed and said we would never see 3 % again. Unamused, Apparently I am missing something. Enlighten me. ->Apparently I am missing something. Enlighten me. You’re missing an appreciation for warm soft lies for what they are. You don’t really believe the 4% unemployment number, do you? The unemployment rate for an antebellum cotton planation was zero, so the US still has a way to go. @unamused Employment statistics are minimally correct on a relative basis. The labor market in the US is much tighter – that is for certain. And workers pay taxes and the benefit to the deficit and debt is 1. paying taxes as opposed to 2. consuming tax revenues (or debt). Your plantation reference is interesting. I chose the working corp version as opposed to the state version. The food and self esteem are better and fear is lessened. ->The people voted for a Republican president and Congress. Almost half of them. The rest still resist the propaganda. Republicans can just sit tight until their Russian and other foreign friends hack the next election for them. Won’t the blue wave Democrats be surprised. Then they’ll finally have enough support for a new constitutional convention of corporations. Your gangster capitalist job creators will finally get the government they really want and will no longer have to settle for sneaking inadequately profitable laws through. In the new corporate utopia your all problems will be over and you will finally be able to live happily ever after to the end of your days. Amazons minimum wage is now twice that of the Federal minimum wage? What’s next? Labor Unions arguing for wage cutbacks and smaller benefit packages and less onerous environmental rules? Amazon might be able to automatically remove felons and heroin addicts from the resumes they receive but Henry Ford had the same idea as I recall, making the workers by extension, consumers of their own products. ->Texas resembles South Africa where the white minority controls everything to the exclusion of the majority. In a democracy, voters choose their representatives. In whatever it is the US has going, politicians choose their voters. For nearly all Americans, survival now largely depends on selling your soul as cravenly as possible in the deperate attempt to get a halfway decent price for it. Abject failure is common. ->Only 50% participate in a presidential year and only 25% in a mid term year. If the gods had meant for you to vote, they would have given you candidates. As that firmly reality based dude at the Fed pointed out to us recently – Jerome Powell – we just need to cut mostly already funded social benefits like Medicare, Medicaid, and I’ll go out a limb here and but a few words into his mouth – Social Security, too. According to the Oracles at the Fed, programs like this that a fully funded (when properly managed) are what is causing all these deficits. That’s why we must worry about them and cut/eliminate them now so we give Jerome’s Ultra Rich Friends and Rich Gigantic Corporations (our True Gods) more tax cuts and also fund our multi-trillion dollar Dept of War & Aggression – those programs have allay been fully funded too with Trust Funds so the never ever contributed to the deficit. I wouldn’t necessarily read Powell’s comments that way. He spoke of the “uniquely expensive” US healthcare system. You know what other feature of the American healthcare system is unique among all advanced countries? The fact that it lacks compulsory universal coverage. Seems to me he is hinting that the US needs to move in the direction all other countries have long been headed on this issue – and that would involve more government involvement in the matter, not less. I have read that 40% of healthcare costs are incurred in the last 90 days people live. Further, the ratio of “administrators” involved compared to the number of actual healthcare providers (like doctors) has skyrocketed with layer after layer of bureaucracy (insurance companies primarily) involved. I can remember when most people went to see their doctor, paid his book keeper/secretary cash on the way out the door, and that was the end of it. He didn’t say that the government should cut healthcare or the aging population. What he said was that both are a drag on the productive economy going forward and make it harder to deal with the debt. This “uniquely expensive healthcare delivery system” (much of it in the private sector) eats up close to 20% of GDP. This makes it hard to have money left over to deal with the debt. His solution is a reduction in the GOVERNMENT DEFICIT! and what is that money spent on, or where does it go???? I believe this is money the general fund borrows and then gives to the SS, Medicare and Medicaid programs as they redeem money (special IOU’s) they lent to the general fund over many years. And they are redeeming those IOU’s because they are taking in less than they are spending. Federal debt / GDP has remained steady at 105% so the increased in debt is not so much alarming as it sounds. Though corporate receipts have plunged, corporate profits have jumped,…will see how that pans out on the personal consumption side. Maybe supply side economics might work after all! Tax receipts are not even keeping up with inflation (near 3%); and spending rises far faster than GDP. This is completely dysfunctional from a fiscal point of view. With economic growth like this, the budget should produce a slight surplus, so that when the economy slows it can go into deficit mode. My numbers may be off because different sites have different numbers. Actually, your numbers are off because you have the concept completely wrong. It is only the INCREASE in spending from one year to the next that contributes to increased GDP. ->So where did all of this $1.27 trillion go? Asian countries with ‘compliant’ governments (desperately poor and devoid of regulation), but mostly overseas tax havens. Your tax dollars at work, defraying the cost of offshoring. Federal incentives, you know. Every trillion represents more tens of billions in rentier profits. They like deficits and debt, the more the better. And more pressure on the toiling masses, like squeezing toothpaste from a tube. The wealth transfer continues. It is not being transferred to, well, you, for example. The US economy is being liquidated, and naturally one limits investment in cash cows. Besides, it costs a lot to garrison the planet, so the infrastructure will not be fixed, at least not in the US. Half the country has been economically repressed rather severely and supports these programs to ensure the other half is also repressed. US politics is largely driven by spite, malice, delusion, and deception, all happily cultivated and exploited by avarice. USA USA! This is true for a very small portion. Most of it goes towards paying for things domestically. Public and private. Every mortgage in this country is subsidised and is ultimately paid for via debt. Military, federal spending, federal programs paid to states. The list goes on. ->So, in short, it pays for the lifestyle that you and I enjoy. You don’t speak for my lifestyle, Man. Statistics suggest most Americans don’t enjoy their lifestyles very much at all, mostly because their job is to pay for yours. When you compare debt to GDP, you need to use “nominal” GDP (not adjusted for inflation, because the debt is not adjusted for inflation either) to get apples and apples. Nominal GDP is growing at over 5%, going close to 6%. Not all government spending contributes to GDP (such as interest payments and social payments that people don’t spend). What goes directly into GDP are the goods and services the government buys (vehicles, supplies, computers, tanks, healthcare) or invests in (infrastructure, etc.). OK, thanks. Using 5.4% for GDP growth and adding interest paid on $20 trillion would account for the missing amount. It does make me wonder if there really much “Growth”. It looks like a lot was just borrow and spend. In the United States we live in a magical delusion where reality is disconnected from facts. It’s funny to see politicians talk about American Exceptionalism and the American Dream. It’s even funnier (and scary) when you meet people who believe this nonsense. As if Americans have some special claim on wanting what’s best for themselves and their families. This article gets to the heart of this delusional thinking. We are truly exceptional with applying economic and military imperialism. The system of debt the world is forced to use at gunpoint is what allows this charade to continue. The risk is packaged up, sold off, cut up, ‘hedged’ and everything else you can imagine. But ultimately the risk resides with the US govt and is stuck on the balance sheet which never balances. Nothing is free and ultimately it is ‘balanced’ through debt and deficits which are financed by the rest of the world through coercion or other threats of retaliation. This is the American Dream folks and the whole world participates… willingly or not. This article is proof positive of how the system works and why we shouldn’t buy the BS. the worlds reserve currency. No worries . ->It owes most of its money to itself. Exactly. The 99% owes most of its money to the 1%. World currency is also a function of size.. and of a legal system that works. If you write a contract in US$ you can enforce it. There just aren’t any other places in the world where you can trust their legal system where the size of their economy is large enough. Great Britten was large enough when it was the English Empire but not now.. The Euro isn’t even big enough. Few trust the Russians and their economy isn’t big enough… We all know the way that China balances its accounts. So who or where can International Business go to write and enforce its deals? There is no alternative. As they say, most longstanding empires rot from within. Things will get better again after we collapse. not surprising, since democrats and republicans alike overwhelmingly voted to increase the military budget to over $700 billion. if the war mongers don’t get us all killed first, they will surely bankrupt us. Two trillion and rising. $700 billion is after the accounting tricks. Google up ‘two thirds on defense’, remembering that costs have gone way up since then. Forever wars against hordes of straw men will cost more than your descendants will ever be able to pay, try as they might, but they are infinitely profitable if you have the right connections. Infinitely more than the $20 trillion that nobody can account for. The cost of eternal, unwinnable war against constantly shifting, nebulous enemies (ref: ‘1984’, Orwell, G., 1948), mass deindustrialization and a obscenely wealthy elite – both individual and corporate – that won’t pay its fair share into the commonwealth (having convinced the political class that the provision of jobs is an altruistic act…) = 21 trillion and rising. PS to add plus a president who laughably thinks that the measure of a country’s economic prosperity, is the level of an index on it stock market. The position of a squiggly lime on a computer screen which is the result of nothing more than rampant speculation predicated on cheap credit. Laughable, dangerous and tragic in equal measure. Judging by Japan’s experience, this baby has a long long way to go. Then if Argentina can issue 100 year bonds…. I wish we had it written in the constitution a balanced budget clause, government can’t spend more then they can take in in taxes, expect in times of war. But we like our free lunch, who cares for the future generations. Yet our immorality and arrogance in enslaving with debt people that are not born yet makes me uncomfortable. Nothing so pleased the politicians as the discovery that they could buy elections with money stolen from people who can’t vote because they haven’t been born yet. Hopefully, future generations will be able to get good jobs and pay all it back, after the rest of the economy has been offshored and despite their crushing student debts. And if not, they will have no one to blame but themselves for so irresponsibly choosing bankrupt parents. People have been suckered into believing that Tax Cuts for the Obscenely Wealthy pay for themselves for two generations now, which definitively proves that capitalism is the extraordinary belief that the nastiest of men, for the nastiest of reasons, will somehow work for the benefit of us all. Apple to Apples comparison. Apple’s market capitalization is 1/21’th of the outstanding public debt. Books get sold, that’s all that happens. These are the Boom Times because of deficit spending, both public and private. Aren’t your friends and neighbors who are deepest in debt more fun to be around? At least while the debt party is still going on, that is. Anyone who read Paul Samuelson’s “Economics” in college knows that we should not be ringing up such large deficits in boom times. Government expenditures should have been cut back, not increased. We didn’t need to increase “defense” spending by $50B when we were already spending far too much. We didn’t need the cutback in corporate taxes. We certainly don’t need more entitlement programs. But what could have been realistically expected from Washington? Turn on TV, what passes as the “news,” and it is clearly evident that we’re being governed by craven, opportunistic, political hacks of one stripe or another. It’s a miracle that we have any good people at all left in DC. Will the last sane politician to leave please turn off the lights? Samuelson’s book was written under a gold standard monetary system. Since the 1970s we haven’t been in that system anymore, although it has taken a couple generations for people educated in the prior economics to realize that this changes everything. At least until people lose faith in today’s full-faith-and-credit (but no gold!) money system. So, in the 1980s the fiscal hawks said the doves believed in “tax-and-spend” policies. The the 2000s the hawks complained about “borrow-and-spend” policies. Then we got QE, which was print-and-spend policy. The solution (has been for a while) is direct fiscal stimulus. Instead of paying out incentives to corporate America, provide the stimulus directly in the form of tax breaks (which only helps those wealthy enough to pay taxes) or in the form of a check. It’s bound to further? heat up inflation, (solve the interest on the debt problem) and put US GDP at parity? with China. Also to provide a buffer for the global recession when ROW sloowwws down. It IS direct fiscal stimulus but it could have been delivered as a $10,000 check to every US taxpayer. To partisan politicians, paying ALL the taxpayers is a waste of money. That’s why they spend so much energy trying to deliver benefits only to their own voters. Jerome is all talk and no action. Let’s see him raise rates by a full percentage point in December and then do the same four times in 2019. THAT would pull the plug on this farce once and for all. The interest on the debt would skyrocket and suddenly create a crisis which would force the politicians to act. Instead he just flaps his gums like the rest of them. The Fed rate hike policy is to “put a collar on the dollar.” Rising yields on the long end are balanced by rising Fedrates. A steepish yield curve would heat things up? HYG ETF is making new highs so Fedrates are really not walking the walk. WTIC made a new high. TIP ETF broke below its 200ma while yields are rising (reverse correlation). Sticking to Doug Noland periphery to core dynamics. Powell is playing defense. The US is in a unique position in the history of monetary policy, where for the first time a non-gold based currency is king, and it’s strength is projected by means of military policies. In these policies I include economic sanctions, restrictions in dollar trade, confiscation of assets as well as good old raw power. What is very worrisome in respect to this amassing deficit of ludacris proportions, is that the opportunity to build&rebuild is not even considered let alone pursued. Instead they opted to entrenching their internal positions by pushing as much funding as possible into their own projects. They are preparing for the post dollar world. I do however suggest looking at other countries where “austerity” has been imposed to “balance the budget”, either by outside authority such as the IMF, or internally by some version of reactionary neo-conservatism (neo-liberalism outside the US) such as MMacri in Argentina. As far as I can tell, the universal result has been a marked economic contraction, with huge increases in unemployment, poverty, and hunger. and cutbacks in education, public health, infrastructure improvement/maintenance, etc. Examples are Greece, Argentina, Brazil, Spain, Ireland, and a host of African countries. The transition from micro to macro economics is well known. It may well be that there is an economics past macro (mega?) where the usual shibboleths no longer apply. When you have corporations with gross sales greater than all but a handful of developed nations, and total world debt is several times the world domestic product, it seems reasonable that something beyond the accepted micro/macro economics is in action. What these principles might be I have no idea, but then neither does anybody else. The US dollar is a very old scam. It was a convenient acam so countries could drop the gold standard but nowadays all it does is give the US money for nothing. And despite that, the US debt is so big is ridiculous. “But wait — these are the Boom Times!” A lot of people, myself included, thought that when George Bush, the first Chief Executive with an MBA, was elected, we would see some business-like cost-cutting efficiencies like scrapping the Boeing 747 jumbo-jet-full of courtiers and psychophantic reporters in favor of a business jet, but it was not to be: Bush increased the national debt by the SUM of all previous debts (!!!). A few business bankruptcies notwithstanding, so-called conservatives supported Trump’s presidential campaign in the same hope- he even called Boeing on the carpet for price gouging on defense contracts- but it was all a sham- he wound up giving them a record contract for a new fleet of Air Force Ones and a complete blind eye to additional budget-shredding defense contracts. The new operative business model being Wild Bill Hickock (and who was gonna stand up to him). How did that all work out? Bush 43 cut taxes and took the country into an expensive war. You don’t need an MBA to know that these acts were not going to lead to a balanced budget. But they didn’t make him a one term president. In fact, he did better in 2004 than in 2000. Too many “family values” voters put their religious beliefs ahead of their economic well being. Now they have to live with the results. Back in the early 1980’s, David Stockman (Reagan’s first Budget Director) realized that it was much easier politically to cut taxes than to cut spending. Every spending program has its vocal group of supporters but who wants to see taxes go up? I project the following to happen. Spending decreases significantly and people lose their jobs. They file bankruptcy. Why hung up on that connection? Spending is not calculated as a percentage of GDP. Tax receipt doesn’t need to either. Economy doesn’t boom without a catalyst. You can try to ignore the reason, but can’t make it disappear. I like your current quote way better than something like “total tax receipts only reduced by 1%, though the economy, as measured by nominal GDP, shrank at an annual rate of about 4%”.